When people say to me they’re writing a nonfiction book they want to traditionally publish, I often tell them to stop writing. Seriously. Stop writing the book. Because neither agents nor publishers will accept a completed manuscript for consideration. No matter how good it is or long it’s taken you to write. It’s just not the way the industry works. What agents and publishers will review however, is a book proposal. I get lots of questions from would-be authors about writing book proposals, and in this post I’m going to answer the most common ones in case you’re considering writing and pitching a nonfiction book yourself. 1. How long is a typical book proposal? A typical proposal is an average of 50 to 80 pages, typed out in a 12-point serif font, double spaced. 2. How long does it take to write a book proposal? In my experience, a strong book proposal will take between three and six months to write, depending on how much time a writer is able to devote to it and how much of the book concept is developed / formed before beginning the proposal. 3. Should I write my proposal in the first or third person? In most cases, proposals should be written in the third person, in the same “tone” as the book itself. The exception is in the case of memoir, where most agents recommend writing the proposal in first person (again, using the same voice and tone as the book itself). 4. Do I need to write a proposal to pitch a memoir? Until a few years ago, my answer would have been no. Memoirs used to be treated like fiction by publishers, which means they were sold based on the merit of the completed manuscript. Today, most publishers require a proposal for memoirs, which includes sample chapters. 5. 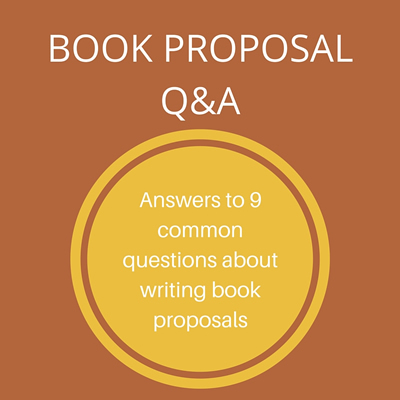 What does a book proposal include? 6. Do I need to write the whole book before I write a proposal? No! In fact, if you know you want to push for traditional publishing, I recommend writing the proposal and then while that’s out for submission, start developing your next idea. 7. Is there a standard format for a book proposal? Definitely. While there is of course a little wiggle room, proposals should adhere to a fairly standard format, which means double-spaced, 12-point serif font, and 1.25” margins on all sides. At the risk of sounding like the Tim Gunn of proposal writing, be sure to edit carefully when it comes to the visual presentation. Fancy designs, fonts, and colors may come across as unprofessional. 8. Do I have to have a title for my book? At the very least, you should have a strong working title for the book, bearing in mind that if you do find a publisher they will have the last word on both the title and subtitle. But your proposal and pitch will be much stronger if you have a powerful title. 9. Is it difficult to write a book proposal? Honestly, I find writing proposals more difficult than writing the book itself. That’s because much of the heavy lifting — figuring out the plan for the book, organizing the content, and establishing a strong voice and point of view for the book — happens during the proposal writing process itself. Writing a proposal actually makes the writing of the book, whether you end up traditionally publishing or doing it on your own, a much easier task. Did I miss anything? If so, leave your questions in the comments and I’ll answer them there.